As soon as we confirmed that Charleston was in our travel plans, I knew this romper would be the first piece I packed. I purchased it last summer for my birthday and it's still one of my favourite and most cherished pieces. I mean… it's floral, totally feminine, but also a touch sultry in a laid back kind-of-way. Although it has longer sleeves, the flare on the sleeves and on the shorts allowed me to catch the cool breeze among the intense and humid southern heat. I love how the floral print has just the right amount of colour, and it's bold without being too overpowering. 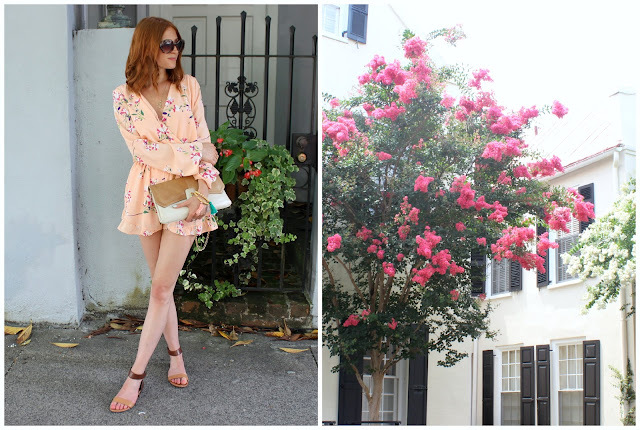 We walked for hours on end discovering the hidden gems in historic Charleston, all while finding the prettiest houses-- I really couldn't decide which one was my favourite! I was like a child in a candy store finding all the homes that complemented my outfit. Thank goodness for Brandon's patience with the camera! Even though we've been home for a week now I'm still dreaming of the perfectly preserved historical houses, painted in pastel hues, accented with colourful shutters and that sit upon beautiful flower-lined streets. I can't be the only one that coordinates outfits to fit the vibe of my destination… Tell me you match your outfit to truly reflect where you're headed, too! You look like you blend in perfectly with your surroundings, so beautiful! Thanks, Joëlle! Loved this city. I've never been to Charleston before, but all of your photos make me want to go! Thank you, Kris!! Definitely add it to your USA travel destination list! Well worth the trek! Love this romper it is so stunning... the colour is amazing and the floral print really makes it pop!